Who can Start a Team? Administrators, teachers, parents, students and/or community members can start a cycling club at their local high school. While it is not necessary, that the person who initiates the club be a school “insider” (teacher or administrator), this can be very useful. A teacher, administrator or school volunteer within the school possesses certain advantages, such as knowledge of the school community, bureaucratic systems and channels, and how to access potential teen cyclists. Extensive cycling experience is not necessary. One should simply have the desire to introduce kids to the sport of mountain biking. Once you have decided to create a team, the Wisconsin League can help educate you and provide all the tools necessary to be an excellent coach. Click here to view the Team Starter Kit. For more information about the WI League licensed coach program, please click here. New teams do not need licensed coaches, but the head coach does need to take steps towards obtaining one. Please contact Don Edberg don@wisconsinmtb.org or Kathy Mock kathy@wisconsinmtb.org if you have more questions. How Big does a Team Need to Be? 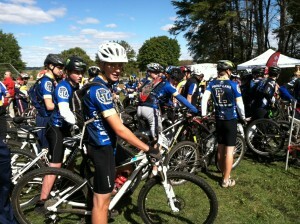 A Wisconsin League mountain bike team can be any size, but the amount of racers a given team can bring to a race may be capped. Teams are broken into Division 1 and Division 2 categories based on their team size (and not their school size). This is only done after a certain amount of teams are in the Wisconsin League. Please see the rulebook (PDF) for more info on Division specifics. When Can We Start a Team? At this time anyone who intends to coach a team should register with the Wisconsin League so that they are covered under our insurance. Wisconsin League teams are limited to the number of weeks they can have pre-season practice. In addition, teams are not insured outside of these limits. 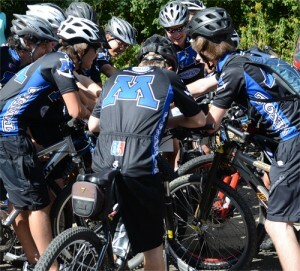 Allowable pre-season activities are bike checks, fun rides, mechanical workshops or skills clinics. All team rides or other training activities must end within two weeks of the final League race. A more detailed description can be found in the NICA Rulebook (PDF). Where do the Races Happen? The Wisconsin League currently spans the entire state. See if there are any teams in your area, if you do not see a team in your area – contact Don Edberg don@wisconsinmtb.org or Kathy Mock kathy@wisconsinmtb.org.